Robots Playing Poker - "Robots Playing Poker" is a commissioned work for a patron who asked me to combine his love of old-school robots with an element of kitsch. The work was inspired by the 1903 painting "A Friend In Need" from the famous Brown & Bigelow "Dogs Playing Poker" series of paintings. 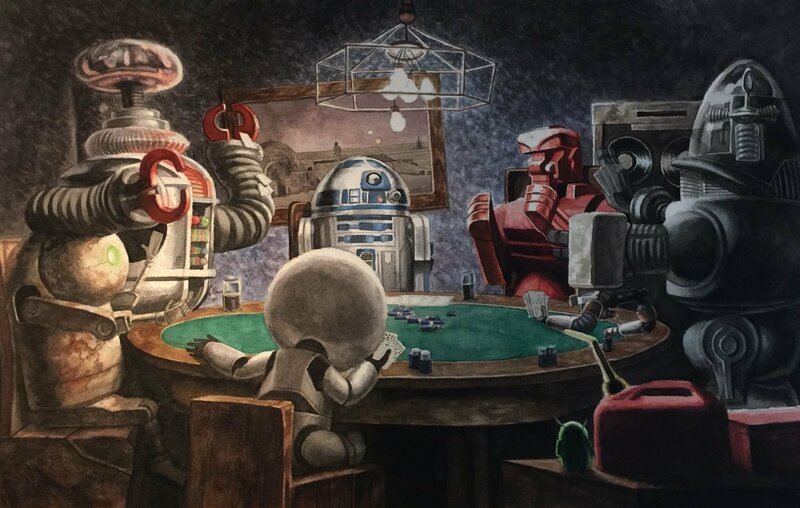 It depicts a poker game at R2-D2's house, with the B-9 robot from Lost in Space, the red Rock 'Em Sock 'Em robot, and Robbie the Robot of Forbidden Planet fame playing poker with a younger generation of robots; Marvin from the Hitchhiker's Guide to the Galaxy, Bugdroid from Google Android, along with Stubby and Pod042 from video game Nier: Automata.